The Slow Readers Club are a Manchester-based band formed by former members of the band Omerta. The band features Aaron Starkie - vocals / keys, Kurtis Starkie - vocals/ guitar, James Ryan - bass and David Whitworth - drums. 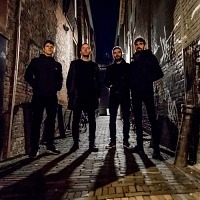 They released their debut album, "The Slow Readers Club" in 2011, followed by: "Live at the Library" (2014), "Cavalcade" (2015), plus 2018's: "Build a Tower".